Square is shuttering its Square Wallet app for smartphones, a sign the mobile-payment startup is struggling to expand beyond its low-margin business of credit-card readers. Square Wallet was recently pulled from Apple’s App Store and Google Play because the app “didn’t have a lot of the utility value” for consumers, Square director Ajit Varma said in an interview with technology blog Recode. Square is trying to appeal to more consumers and create new lines of revenue as losses in its core business of credit-card readers mount. The company charges merchants 2.75% to swipe cards through the readers, but pays about four-fifths of that money out in fees to payment networks like Visa and MasterCard. Square recorded a loss of roughly $100 million in 2013, broader than its loss in 2012, two people familiar with the matter said last month. The closely held San Francisco company has suspended plans for a possible initial public offering and held talks about a potential sale to Google Inc. and others has losses mount. The new Order app will eventually charge merchants a higher rate of 8% to take orders and process transactions. The service competes with a growing field of food-ordering apps that includes Grubhub and Eat24. Square has been adding services that could eventually be more profitable than its main payments business. In the past 12 months it began Square Cash, which helps people send money to friends via email, and Square Market, a digital marketplace for small businesses. It also offers Square Register to help stores track customer data and is testing a lending program for merchants who have difficulty getting a bank loan. 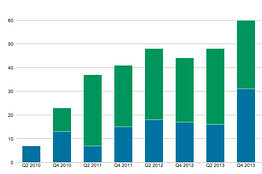 via Square Pulls Failed Wallet App as Troubles Mount – Digits – WSJ Article by Douglas Macmillan. At a time when banks are struggling with revenue and profit growth, mobile banking is emerging as a critical weapon in the battle to retain customers and cut expenses. The average cost to a lender for a mobile transaction is 10 cents, about half that of a desktop-computer transaction and far less than the $1.25 average cost of an ATM transaction, according to data from Javelin Strategy & Research. But the spread of smartphones and tablets also presents risks for banks. Customers today expect their lenders to offer a range of mobile services, from simple functions such as balance inquires and transfers to trickier maneuvers like paying bills through photo imaging. When banks don’t deliver, some customers are walking. All told, about 60% of smartphone or tablet users who switched banks in the fourth quarter said mobile banking was an important factor in the decision, up from 7% in the second quarter of 2010, according to data from New York-based consulting firm AlixPartners. But as mobile-device use increases, more customers are giving it a try.”The world is quickly going mobile, and if banks aren’t there already, they’re way behind,” says Robert Meara, a senior analyst at financial-services research and consulting firm Celent. Some mobile functions are especially appealing. While customers can view balances, transfer money and perform other functions using ordinary computers, they can deposit checks only in person or on a mobile device.”There are few things more inconvenient to banking consumers than carrying a check around and waiting to come to a branch or ATM,” Mr. Meara said. For banks, mobile deposits are especially cost-efficient. J.P. Morgan Chase & Co. recently said mobile check deposits cost the bank three cents per transaction, versus 65 cents for deposits made with a teller. “How come this bank with the kind of weather we have in NJ and NY doesn’t have mobile deposits! I’m just going to switch banks,” wrote one user on the Google Play app store page for Santander’s U.S. mobile-banking app. via Lenders Place Their Bets on Mobile Banking – WSJ.com – Article by Saabira Chaudhuri. Banking institutions are in a race to provide the newest online and mobile features to their users, as retail banking branches lose their relevance fast. That’s because banks know that these services are how they will win over their next-generation of client. This is particularly important in the banking industry because bank customers tend to be extremely loyal. So, capturing the attention of younger adults — and, in particular, millennials — when they’re first choosing their bank can lead to a long-term market advantage. And mobile is already the preferred channel for checking balances among those who are already mobile banking consumers. Among millennials, checking balances, paying bills, and transferring money, were the top digital banking activities, TD Bank finds. More than half of millennials are already transferring money via digital channels. via How Millennials Are Pushing A Huge Shift In The Retail Banking Industry – Business Insider article by John Heggestuen . With CSI’s SPIN, you can provides community banks customers with more direct person-to-person (P2P) payment functionality. The P2P offering delivers a more efficient payment process that allows consumers the quickest access to funds in the P2P industry. 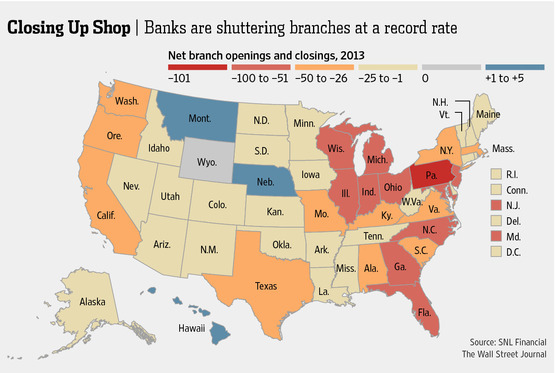 Bank branch closures in the U.S. last year hit the highest level on record so far, a sign that sweeping technological advances in mobile and electronic banking are paying off for lenders but leaving some customers behind. U.S. banks cut a net 1,487 branch locations last year, according to SNL Financial, the most since the research firm began collecting the data in 2002. Branch numbers have been on a steady decline since 2009 and reached a total of 96,339 at the middle of last year, the lowest since 2006, according to data from the Federal Deposit Insurance Corp. Since the financial crisis, U.S. banks have been ramping up mobile and online services and moving away from physical locations to avoid overlap. “There’s less of a need to have branches now,” says Sandler O’Neill + Partners analyst Jeff Harte. Culling branches, with their real-estate, labor and security costs, has become a popular way for banks to boost profits at a time of sluggish revenue and loan growth. No U.S. state or territory logged net bank-branch additions in the cumulative period running from 2010 to 2013, according to SNL. via U.S. Banks Prune More Branches – WSJ.com – Article by Saabira Chaudhuri.